William Henry Nottingham, original Nottingham homesteader. An aggressive entrepreneur, he ultimately was shot to death by his business partner, Ernest V. Hurd, who discharged his gun in self-defense. Hurd would later marry Nottingham’s widow, Angeline. What: Town of Avon’s 40th Anniversary community picnic. When: 5:30 to 7:30 p.m. Thursday, Sept. 13. More information: Free food and drink provided by the town on a first-come, first-served basis. The picnic provides community members with an opportunity to meet members of the Avon Town Council and town staff and offer comments and suggestions. Editor’s note: This is the second part of a two-part series celebrating Avon’s history. Visit http://www.vaildaily.com to read part one. An estimated 30,000 prospectors ventured into the high country around Leadville during the silver boom of 1874. The boom was sustained by the Bland Allison Act of 1878 and the Sherman Silver Purchase Act of 1890, which propped up prices and made silver mining commercially viable. The population pressure decimated the supply of wild game and timber around the area. Early homesteaders in Avon were among the enterprising few who took the mountain pass over to the west side of Battle Mountain to explore the Eagle River drainage for new opportunities. Geologists from the Hayden Geological Survey camping in the area in 1874 came across a few of them catching “sacks full” of fish to sell to the gold miners in the California Gulch near Leadville. The valley floor around Avon, available for free at 160 acres a pop under the Homestead Act of 1862, presented an appealing alternative to the brutality and uncertainty of a miner’s life. With reliable demand from the mining camps, ranching and farming was a sustainable alternative to mining wages. Before long, the entire area was a patchwork of homestead claims. William and Angeline Nottingham were two of those early homesteaders. The details that follow about the Nottinghams come primarily from Mauri Nottingham’s “A Nottingham Family History,” last updated in 2017. Mauri’s sources include primary documents, newspaper accounts and oral family history. He is the grandson of William and Angeline. He died at his home on Hurd Lane in Avon in February 2018 at age 88. William Henry Nottingham and his wife, Angeline “Angie,” were living in Iowa when news of the first major mineral strike in the Eagle River drainage traveled across the country in 1879. Angie’s father was a prosperous businessman, and the couple’s decision to move to Colorado with a newborn and two young children attests to the allure of the gold rush, even for those in comfortable circumstances. William and his brother Edward traveled to Red Cliff and staked a number of claims. Angie and their three children followed in 1882. Edward left Colorado that same year after being acquitted for shooting a fellow miner to death. William worked as a miner and teamster with a wagon and team of horses hauling ore and timber up and down Battle Mountain. He and Angie lived in a mining community a few miles south of Gilman, where Angie gave birth to Harry and Emmett. With cash from his wife, in 1886 William bought for $800 the rights to Josiah Herwick’s 160-acre homestead in the vicinity of today’s Walmart, laying down the Nottingham roots that survive to this day. William and two neighboring homesteaders, Ernest V. Hurd and Peter Puder, formed a partnership for the purpose of “ranching, log hauling, ore hauling and leasing and working of mines.” They controlled four homesteads totaling 640 acres and built irrigation ditches, raising cattle and growing oats, hay, millet and potatoes. With the 1893 repeal of the Sherman Silver Purchase Act, the world began to unravel for the Nottinghams and other Avon homesteaders. The Nottingham/Hurd/Puder partnership got into financial difficulty, and the partners began to quarrel. Peter Puder committed suicide in April 1896. 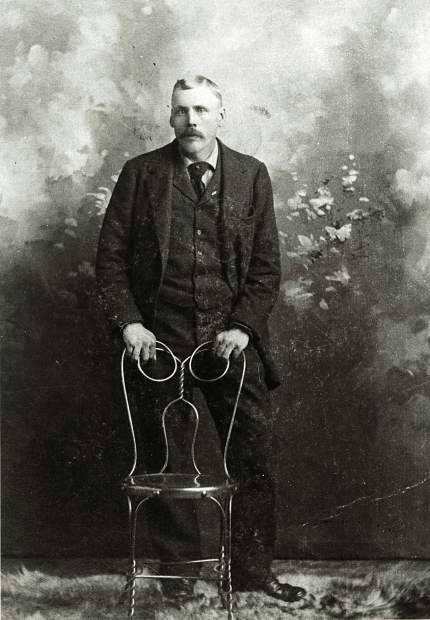 A few months later, William accused his other partner, Ernest Hurd, of “alienating” the affection of his wife and took a shot at him on the streets of Red Cliff. He missed, but Hurd retaliated by filing complaints against him for attempted murder and for “wasting and frittering away” the business. It all came to a tragic end a few weeks later when William had an argument with his family and set off to Red Cliff to get an arrest warrant for his wife and other family members who had threatened to kill him. William happened upon Hurd in Red Cliff, cocked his revolver and followed him into a stable, where Hurd shot him dead in self-defense. John Metcalf, a neighboring homesteader in Avon, was witness to the shooting. After William’s death, his widow, Angie, and Ernest Hurd jointly managed the partnership and put it back on solid financial footing. They married in 1899, but Hurd died of smallpox in 1901. Angie lived another 28 years, traveling extensively while forcefully overseeing the family holdings. The next generation of Nottinghams prospered, but had their share of controversy and tragedy. Clyde, William and Angie’s oldest son, inherited both his father’s hair-trigger temper and keen entrepreneurial bent. He diversified and expanded the family holdings and, together with younger brothers Harry and Emmett, bought out his mother and sisters to create three separate Nottingham ranches. After years of altercations and charges of assault and battery and attempted murder, a judge gave Clyde the option of serving jail time or moving out of the county. In 1919, Clyde sold out to his brothers and left the county for good. In 1903, Grace Nottingham, William and Angie’s beautiful second daughter, shot and killed her fiance in Minturn after hearing that he had alluded to their premarital “criminal intimacy.” Nottingham family lore suggests that Angie pulled the trigger, but Grace took the rap knowing she was more likely to be acquitted than her mother. She was found guilty of involuntary manslaughter and served just 24 hours in jail. Five years later, Grace was murdered by her estranged ex-husband in a murder/suicide in a Denver hotel. She is buried in the Nottingham family plot in the Red Cliff cemetery alongside her mother, father and infant brother. Two branches of the Nottingham family — Harry and his sons Allan and Arnold and Emmett and his sons Willis and Bill — continued to consolidate their holdings over the next decades until Nottingham ranches spanned from Eagle-Vail to western Avon, including Beaver Creek, parts of Bachelor Gulch, Wildridge and Mountain Star. Starting in 1972, when resort and real estate development supplanted agriculture as the primary economic driver of the region, the ranches were sold to private developers, as the ranching and farming era drew to a close.